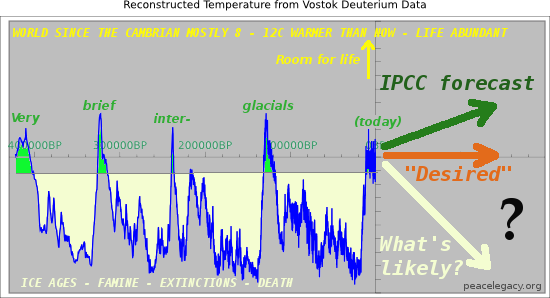 When I started looking into the claims of dangerous warming due to carbon dioxide, I was completely baffled, buried in details of climate models, puzzled by energy balance diagrams, and so forth. Was there a "greenhouse" blanketing the Earth, slowly frazzling us to death? The truth could have been anything. If you've followed this path too, you'll know what I mean. But one thing, one single piece of the jigsaw, cut through all the fog and answered the question. I want to show you the thing that absolutely clinched the global warming question for me. I have postgraduate training in physics, which helped, but the basic point is understandable by anyone, and in this article I want to explain what seems to me the key, conclusive fact in everyday terms. I'll probably be posting quite a bit about global warming, and you might wonder why I think it's a big issue for a site devoted to peace. Well, peace is easier if we aren't all scrapping with each other to eke out an existence in a starving world. True peace (which includes peace with all our nonhuman friends) requires we don't do things that will harm wildlife or damage Earth's capacity to feed us all. True peace should make everyone happy; and if you've seen Gitie's and my wild bird website (wingedhearts.org, you'll know I don't reserve "everyone" just for people.